Mercury Dimes are one of my favorites. They were coined at the US Mint from 1916 to 1945. These silver coins were designed by Adolph A. Weinman and they bear his initial to the right of the obverse design. Weinman is also responsible for the Walking Liberty Half Dollar and consequently the 1oz US silver bullion coin, the Silver Eagle. 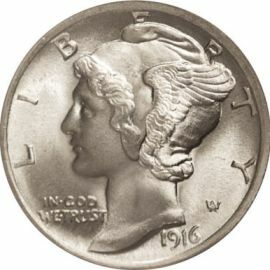 A complete set of these dimes can be put together relatively easily, in high grade, with the exception of the rare 1916-D.
name implies. The portrait on the front is actually that of Liberty wearing a winged cap symbolizing freedom of thought. 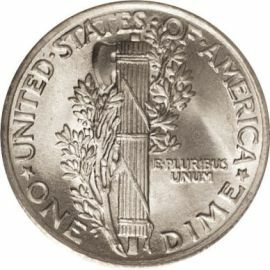 A more accurate name for the coin would be the Winged Head Liberty dime. But the nickname "Mercury" was applied to it early on, and after many years of common usage, has remained.